Dia de los Muertos or the “Day of the Dead” is a Mexican religious holiday that has grown in popularity over the years amongst those who are not Mexican, Catholic, or even religious. One of its popular icons, the sugar skull, has become a favorite design used in everything from wall art to dinnerware. The tattoo community, in particular, has welcomed the sugar skull into its culture as an integral part of its own iconography. But in order to embrace something, you have to understand it and support its significance. So, what is the Day of the Dead and how does the sugar skull fit into the festivities? Dia de los Muertos is celebrated around the same time as Halloween, so the two holidays have often meshed together. But the Day of the Dead is actually very different from Halloween and not at all morbid like the name may suggest. The traditional celebration of Dia de los Muertos started over 3,500 years ago by the Aztecs who practiced a month-long celebration that honored those who had died and welcomed their spirits back to earth for a visit. During this ritual, they would often display skulls that they had collected as symbols of life, death, and rebirth. When the Spanish Conquistadors infiltrated what is now known as Mexico, they brought with them their Catholic faith and began an effort to convert the natives and put an end to the “sacrilegious and pagan” observance. Their attempts to squash the ritual were unsuccessful, but somehow over ​time the celebration was altered to coincide with the more “acceptable” Catholic holidays like All Saint’s Day and All Soul’s Day. Today, Dia de los Muertos begins on the evening of October 31st. Legend says that the gates of heaven open at midnight and that the souls of dead children –angelitos– are the first to visit their loved ones still on earth. They roam the earth for just one day, and then the following midnight, the gates are opened once again to allow the adult souls to descend. The dead are welcomed by their families here on earth through the construction of elaborate altars known as ofrendas, or offerings. The altars consist of many items that are well-considered with the dead loved ones in mind. Flowers, particularly marigolds, are laid out for their bright color and strong scent, which is supposed to lead the dead to their altar. Other potent smells such as spices, incense, and scented candles are often also part of the ofrenda construction for the same reason. Pictures of the deceased, portions of their favorite foods and drink, toys for the angelitos, and other personal items are displayed on the altar table in honor of those who have passed. Even grooming items such as soap and shaving supplies are sometimes left in the belief that the souls will be weary from their long journey and in need of freshening up. One of the items almost always displayed somewhere among the items of the ofrenda is the sugar skull. What is the history and significance of this popular icon? Because the chronology of Meso-American history is so muddled, it's unclear as to when and how the use of sugar skulls became popular in the celebration of Dia de los Muertos. What we do know is that it was the result of the cultural merging after the Spanish conquest in the sixteenth century. The use of sugar art (including skulls) in the celebration of All Saint's Day can be traced back to twelfth-century Europe. Following the immigration of nearly 200,000 Spaniards, sugar plantations became one of South America's largest economic resources. Whether it was because the natives were forced into slave labor or a friendly exchange of cultural practices, the history books don't say. But at some point, the making of sugar skulls was introduced to the indigenous people who still remained, not having fallen victim to disease or genocidal slaughter brought on by the Spanish settlers and their armies. Since sugar was abundant and relatively inexpensive, it's logical to conclude that the early Meso-Americans would have found the making of sugar skulls a satisfactory substitute for real skulls, a practice which would have been abolished along with all other native rituals. Over time, the newly defined Catholic rite would completely dominate any other religious notions, with the threat of death as punishment for those who would dare resist. Jumping forward to modern day, the sugar skull is now an important integral part of the Dia de los Muertos celebration. Just as the use of real skulls was a symbol of life and death to the ancient tribes during their month-long ceremonies, the sugar skull now represents the celebration of life and death as part of the modern-day festivities. Although the Spaniards all but erased the existence of an entire civilization, this one remaining - albeit altered - ritual seems to be the only hinge that still connects modern-day Meso-Americans with their ancient predecessors. The present-day observance of Dia de los Muertos could be seen as a way to honor those dead ancestors as well as immediate family members. Sugar skulls are made from very few ingredients - sugar, meringue powder, and water. The mixture is pressed into a mold and allowed to dry, creating a plain white three-dimensional skull. 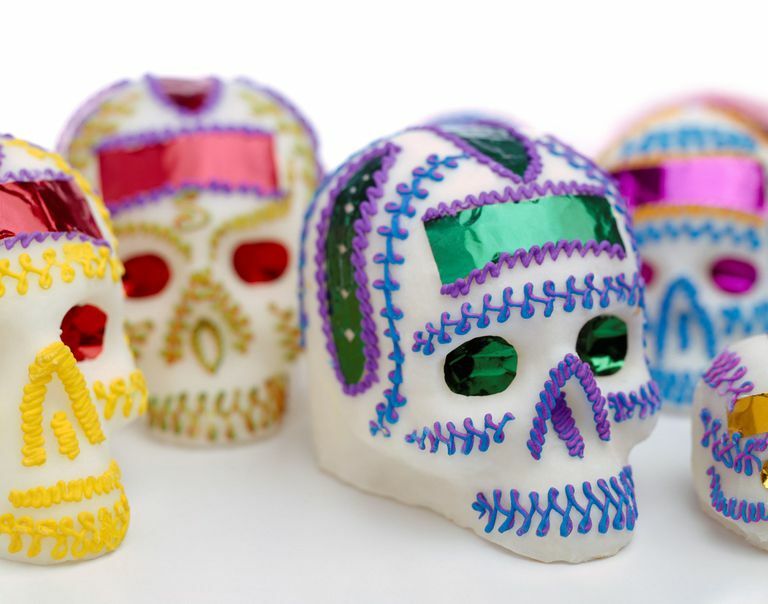 The artistic part of sugar skull creation is how it's decorated once the molded skull is formed. Icing in numerous bright colors is used to trim the eyes and adorn the head and face. But not all decorations are edible. Feathers, flowers, hats and other objects can be used to make the sugar skull more personal in honor of the dead loved one it's made for. Sometimes a blank area is left on the forehead for writing the name of the deceased that it's dedicated to. The making of sugar skulls is a great project to share with friends and family while reflecting on the happy memories associated with lost loved ones. Sugar skulls aren't dark and morbid; they're colorful, whimsical and cheerful, sometimes even humorous. Then they're placed on the ofrenda along with all the other honorary gifts. Large three-dimensional sugar skulls typically are not eaten, but sometimes smaller ones are given to friends and family still living. Their names are placed upon the foreheads of the smaller, two-dimensional skull and they are invited to "eat their own death," another way that they acknowledge the belief that death is nothing but the passing from this life into the next. You don't have to be Catholic or even Christian to appreciate the artistic value of the sugar skull. On paper, the decorative shapes and lines can be even more intricate than on real sugar skulls piped with thick, sticky icing. Artists have enjoyed the use of the skull as an artistic platform for centuries. Integrating the whimsical nature of the sugar skull with other tribal and artistic influences has given birth to a postmodernism quality in present-day sugar skull drawings, paintings, and tattoos. While sugar skulls created purely for artistic (rather than religious) reasons may have developed their own identity separate from the Catholic/Mexican culture they came from, I think it's still important to recognize and respect the history of these beautiful, cultural artifacts. If you want to get a tattoo of a sugar skull, there really isn't a defined set of rules for the design. The shape of the skull itself can be the more traditional squared chin shape or the more exaggerated Oaxacan style with the high, protruding cheekbones. The skull can be decorated with pretty much anything you want: flowers, swirls, stitches, geometric shapes, stars, dots, lines, etc. 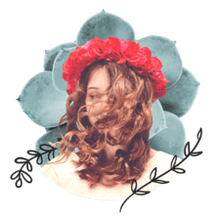 If you're having trouble coming up with ideas on how to adorn your sugar skull, your tattoo artist can help you decide based on things that you like. As with any tattoo, the only rule of thumb is to never copy someone else's idea. Come up with your own and it will have a lot more meaning for you in the long run.